On the face of it this must be one of the strangest ideas ths boy Gedge has ever had. 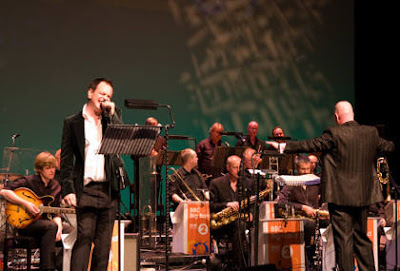 Taking a selection of his classic Wedding Present and Cinerama songs and performing them with what can only be described as a big band, given away slightly by the fact that they celebrate under the moniker of the BBC Big Band. This surreal event took place at the West Yorkshire Playhouse in David Gedge's hometown of Leeds on 29th April as part of the Fuse Festival. So does it work? If you missed the programs, two half hour sets broadcast on BBC Radio 2 then you really must give this a listen as you will probably never hear it's like again. It really is a bit of a strange experience. Most of the tracks actually work pretty well. Brassneck for example sounds incredible. The only song which to my ears falls down completely is "And When She Was Bad" but what do I know. Please use the comments facility below to vent your opinion on this... erm... thing. Only a true fan can sit through this whole thing. This is the scariest thing I've ever seen on the Net. How am I going to sleep tonight? Christ almighty, what was he thinking. I was there. It was great, but I think you had to be there!! Well, I like this a lot and I think you guys are not very versatile. Thanks a lot for uploading!